A grateful tip of the hat to Christopher Hampton and Don Black. They are lyricists for Sunset Boulevard, inaccurately known as “an Andrew Lloyd Webber” musical. Thanks because, in all of musical theaterdom, they wrote one of the few songs celebrating New Year’s. Other shows feature songs which tug at the holiday strings for fetes and feast days religious, secular, governmental, and banking. New Year’s Eve and New Year’s Day, not so much. And New Year’s can be as dramatic as a holiday can get: anticipation, dread, and the happiest of hopes for what might come. Curtain Up!, which takes place a bit later this month, is local theater’s equivalent of a ball-dropping ceremony. The September 18 start of the new theater season holds as much dramatic tension as any December 31, and there are certainly many musicals coming our way. As of this writing, a couple dozen musicals have been announced for production on this region’s professional stages during 2015-16. Of course MusicalFare, which jauntily calls itself “a theater of note” because it devotes itself to musical theater, has come up with a mixed bag of titles, classic, contemporary, and vintage. And O’Connell & Company, also dedicated to musicals, will present two intriguing works in this genre. Two more companies make the “of course” list, Shea’s Performing Arts Center and Lancaster Opera House, which every year include musicals in their rosters. Notable, though, is that this season theaters better known for their dramatic programming have scheduled a musical or two while staying consistent with their company missions. From the gracious Irish Classic Theatre to the rough and ready Subversive Theatre Collective, from the steadfast Kavinoky to the ingenuous Theatre of Youth, they are all facing the music: Audiences hold a place in their hearts—and their wallets—for musical theater. These producers of drama might also be reaching out to new audiences, those who only go to musicals. Some think musicals mere schlock, the stage equivalent of a McNugget meal—of insipid quality and too popular to be any good. A reductive judgment at best. The ample spectrum of musicals and the variety of ways in which music is used within these shows defies that McLogic. All theater attempts to be entertaining, naturally, and the traditional American Broadway musical is particularly eager to please. Music can be the liveliest part of a theatrical event. 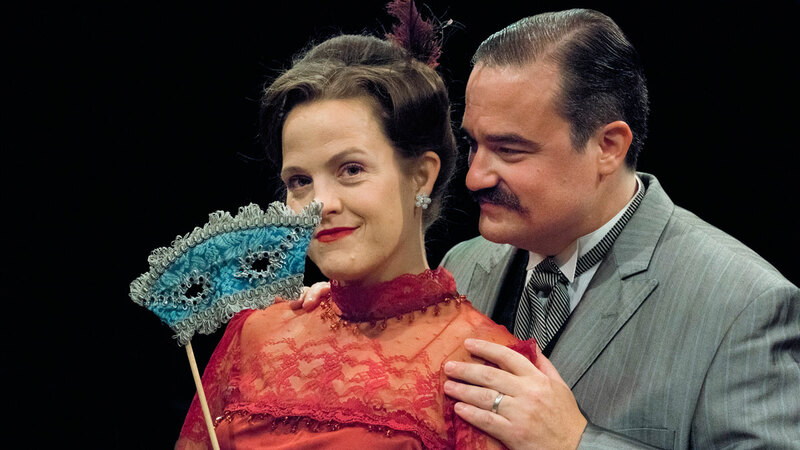 The traditional American musical offers a pattern rooted in both operetta (songs and scenes sandwiching each other) and music hall (with star turns, dance breaks, and specialty numbers tossed in for good measure). The sequencing of spoken word and sung lyric in order to tell a story, leading to, one hopes, a climax in each act and a grand finale at the end. How to Succeed in Business Without Really Trying (Musicalfare) will be a good example of this. Song follows scene follows song in the saga of a young man’s speedy career ascent. Set in the world of New York City commerce circa Mad Men, the musical has a similar satiric intent although a lighter heart. Rather than Mad Men’s retro cynicism, How to Succeed is a tribute to Kennedy-era optimism, as reflected in its bouncy score by Frank Loesser. Adding other actor-singers to the mix establish moments rich in dramatic content as well as musical complexity. In Ordinary Days, a post-Sondheim, post-9/11 musical being presented by O’Connell & Company, two couples croon their interpersonal crises by way of Adam Gwon’s intimate and introspective music. On a more virtuosic level you might hear “A Weekend in the Country,” the Act One closer of A Little Night Music, during which half a dozen characters harmonize their leisure plans, both recreational and adulterous. Music can establish time, place and mood, rather like aural scenery and inner lighting. In the Heights is set in Washington Heights, the upper Manhattan enclave of Caribbean- and Hispanic-American immigrants. The score paints a cityscape through its percussive rhythms and intoxicating melodies, suggesting a neighborhood of bodegas, nail salons, and pop-up stores. Sometimes the story of a musical is music itself. Audiences will have opportunities to experience this in several productions this season. End of the Rainbow is set backstage during Judy Garland’s final London appearance. During the show, the Kavinoky Theatre’s stage will showcase numbers from that fateful 1969 engagement. Subversive Theatre Collective will present the music-based The Last Will of Joe Hill, inspired by the work of the gentleman provocateur. Hill crisscrossed the United States spreading the word of radical labor. His medium was music, devising lyrics about class struggle set to religious hymns, folk tunes, and other popular melodies. Kind of suggests that music is the original social media. Similarly, How I Got Over proves the potency of religious music. The lives of four outstanding Buffalo-based gospel singers are recounted by way of oral history and performance of those ageless gospel songs. Paul Robeson Theatre revives this original show, which premiered there in May 2015. In my experience, How I Got Over is one of the most important plays in the effort to put Buffalo’s history on stage. No matter how seriously intended a stage musical, the musical component should provide something of a romp. Even propaganda, moral messages, religious dogma, and turgid lessons are most easily swallowed through music. Romp will be intrinsic to most of the musicals staged in Buffalo this year but the aggregate musical theater season will be as diverse as music itself. The Big Bad Wolf sings his version of the momentous meeting with three pigs. King Arthur saves Britain through less than chivalrous means. A couple of centuries later, Charlemagne’s son discovers his corner of the sky. Closer to our own day, a red-headed orphan teaches Franklin Delano Roosevelt how to encourage depressed Americans. And perhaps this year you will walk out of a theater singing the songs you have just heard.